Only a small part of rocks are stable on earth´s surface, as widespread erosion and alteration shows. Magmatic rocks, like granite, crumble and minerals composing these rocks, like feldspar and mica, react with water to become soft clay. Similar things happen to metamorphic rocks, eroding under atmospheric conditions. Often metamorphites, formed deep within earth, quickly start to decay already during uplift. Especially unstable are metamorphic rocks formed under very high pressure (25-30 kbar) and temperature (650-700°C), conditions as found in earth´s crust in a depth ranging from 56 to 186miles (90-300km). One locality where such Ultra-High-Pressure (UHP) rocks are partially preserved are the Western Alps between Italy and France, in particular the Dora-Maira Massif. Fig.1. 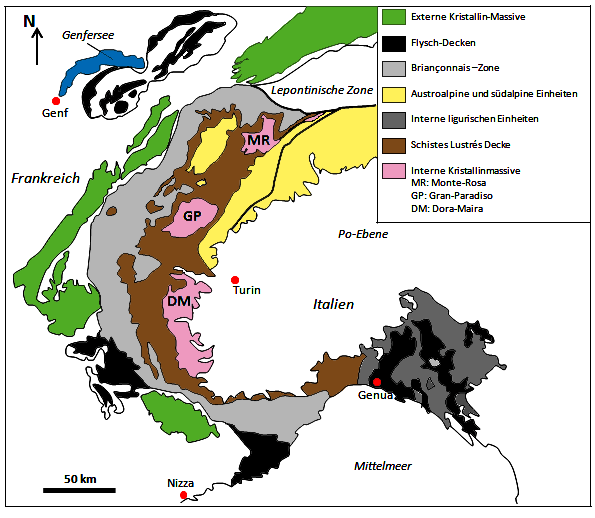 Geological map of the Western Alps DM=Dora-Maira-Massif, by Phil Mair 85, source Wikipedia. 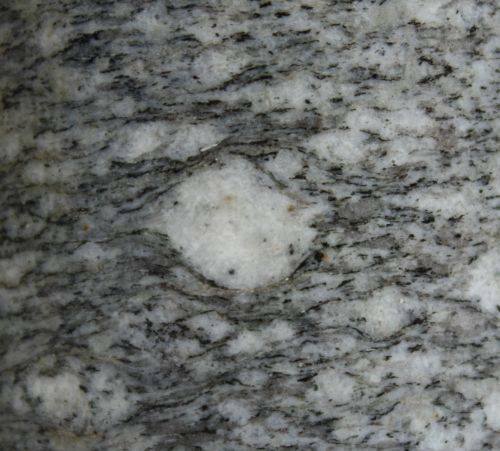 Here whiteschists, named after the white-greyish color, are embedded as large lenses in a thick layer of gneiss. The whiteschists are geologically speaking not true schist, as this term refers to low grade metamorphic rocks, but pyrope-quartzites. This rock is composed mostly of quartz with large garnets (pyrope) embedded within, also some other typical metamorphic minerals, like kyanite (an aluminum bearing silicate), talc (a magnesium bearing silicate), phengite (a mica variety) and rutile (a titanium dioxide), can be found. Especially interesting is the presence of the high-pressure modification of quartz, called coesite, and the pink mineral ellenbergerite. Ellenbergerite is a complex magnesium-aluminum-titanium-silicate known only from the Dora-Maira-Massif and described for the first time as typical UHP mineral 30 years ago. The minerals are preserved as grains in large garnet crystals, the crystals acted like a pressure chamber preserving these unstable minerals. Both ellenbergerite, coesite and garnets formed when parts of the oceanic crust of the Penninic Ocean were subducted into a depth of at least 186miles. During the later uplift forming the Alps minerals like ellenbergerite and coesite adjusted to changes in pressure and temperature by decaying into other minerals, coesite becomes for example common quartz. However mineral grains entrapped in the larger garnets remained, like in a closed pressure chamber, under high pressure conditions and were also protected from circulating fluids. Fig.2. Outcrop of pyrope-quartzite. 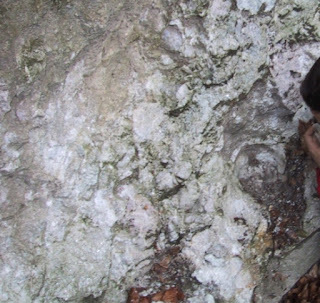 Some of the garnets embedded in the white quartz-phengite matrix are more than 10 inches in diameter, unfortunately very requested by mineral collectors only the casts remain here (geologist is sadly looking at the hole...)..
Fig.3. UHP rocks are rare even in the Dora-Maira Massif, as most decayed during uplift, adjusting to lower pressure and temperature. 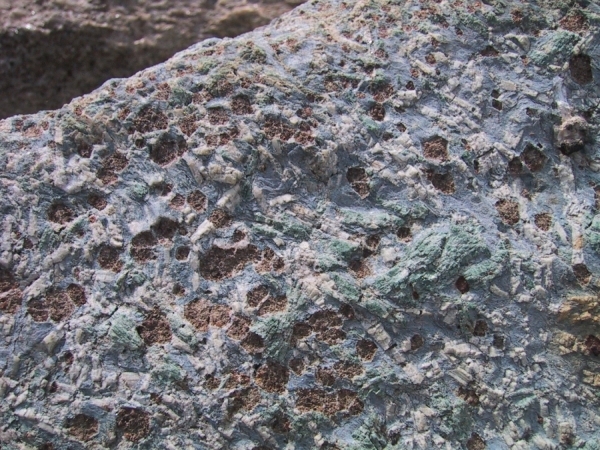 Evidence for medium-grade metamorphism during uplift is the presence of blueschists, here with blue glaucophane-amphibole and alterated garnets. At the time of the discovery an unique find in the Alps, similar UHP rocks are nowadays described also from China and the German Erzgebirge. 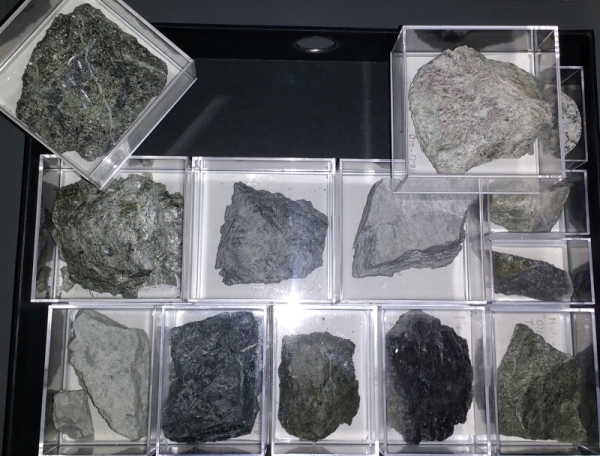 If you eventually enjoy my blogging or like the historic titbits I share on social networks and would show some gratitude - I´m not asking for money but rather some samples to expand a rock collection used for teaching purpose. If by chance you got some smaller samples (6x8x4cm/8x8x4cm or smaller would be enough) with basic info (where, when, who, what) to share, drop me a mail at HistoryGeology"add"gmail.com to discuss details, direct contact and refund. The first colonists arrived on Hawai´i probably in the years 800-1.000. Lacking a written history their nevertheless developed a rich oral tradition, inspired in part by past events. One of the most important stories involves the volcano goddess Pele and her youngest sister Hi‘iaka. Once, so the myth, they arrived on Hawai´i and after a long search Pele decided to settle on the summit of Kilauea, since then also named Kalua o Pele, the pit of Pele. She send her youngest sister Hi‘iaka‘aikapoliopele (generally shortened to Hi‘iaka) to search for Lohi‘au, a man Pele loved. The sister promised to bring him back to her and Pele promised as reward to her sister to spare the beloved forest of Hi‘iaka from fire and lava. Hi‘iaka had to overcome many obstacles, but finally she managed to bring Lohi‘au back to Kilauea. However Pele had grown tired in the meanwhile and in a moment of anger she burned the entire forest. Hi‘iaka for revenge take Lohi‘au and Pele, seeing the two together, became so envious that she killed Lohi‘au during a furious eruption. Hi‘iaka desperately searched for many weeks the corpse of Lohi‘au between the lava and rocks send by Pele. Fig.1. On the rim of Pele´s pit, painting by P. Hurd, 1824. It maybe is possible to interpret this myth in a geomythological way, linking it with features really found in the landscape and the geological history behind the formation of such features. The caldera of Kilauea is dated to 1470-1500 and also the Aila‘au flow (named after another Hawaiian deity), a large lava flow covering the north side of Kilauea, formed around 1470. Morphology and a well developed network of lava tubes suggest it formed during a single, prolonged volcanic eruption of Kilauea. The historic date makes it seems reasonable to assume that the event was watched by the locals and possibly the event was recorded and passed from generation to generation in form of a myth. The destruction of Hi‘iaka´s forest by the furious Pele could describe the lava burning down the vegetation around the crater, suggesting also that before this eruption enough time passed from the previous eruption to grow a dense forest. Also the last part of the myth is interesting. Hi‘iaka moves and throws rocks into air during her search, maybe the description of an explosive eruption or explosions resulting from the lava coming into contact with groundwater or the sea. The interpretation of myths in geological light helps also to better evaluate the risk, as eruption style of former volcanic events and the impact on the society can be reconstructed in more detail than just from studying the volcanic deposits. Fig.1. Medieval engraving of a scala naturae showing the "ladder" concept. The words on the steps read: rocks, flame (as a chemical reaction), plants, beasts, humans, heaven, angels, god. The scala naturae or great chain of being placed all natural objects in a supposedly divine order and can be traced back to the ancient Greek Aristotelian philosophy. A common scala naturae in the 18th century started with less complex objects, like the (supposed) elements air, water, earth, to proceed towards metals, salts, rocks, corals (as half plants, half rock), lichens, higher plants, animals and finally Homo sapiens (just outclassed on the highest steps of the scala naturae by angels). Until the 19th century also science reflected this chain, as it was divided in physics, chemistry and natural history, the latter including the study of animal, plants and rocks. Still in the various disciplines a certain order, from the inanimated to animated, is present. Around 1800 for the first time it was suggested that the science of “biology”, or the philosophy of life forms, should study the laws that rule and circumstances that enable life as we know it and, more important, be distinguished from geology as the study of earth and its lifeless matter. However the idea didn´t at first attract much interest and still in 1842 German botanist Matthias Jacob considered the proposed distinction between the animated an inanimated world an absurdity, as there could be found a gradual transition between every single object. However Jacob was among the last opponents, as indeed biology had started to become an own, distinct scientific discipline. However still some interdisciplinary ideas survived. Like in crystallography, many biologists believed at the time that there exists, like for crystals, a smallest possible unit of life, a physiological unit or like Darwin proposed in 1867, a “gemmules”. 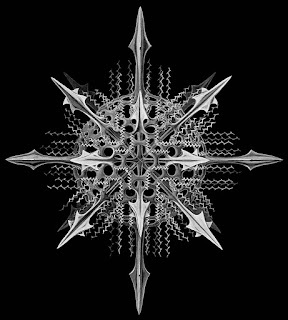 Ernst Haeckel even named this supposed smallest entity (even smaller as a cell, at the time the smallest observable organic structure) “Kristalloid” in 1876. Like a crystal forms and can grow by putting together the basic unit cells, an organism was composed of smallest units, each possessing the “lifeforce” and so giving life to the entire being. Only at the beginning of the 20th century and discovery of cellular organelles and DNA the idea of such "living basic units" was abandoned. In medieval times the Alps, especially the alpine regions above the tree line, were simply referred as Gamsgebirg - the chamois mountains. Fig.1. 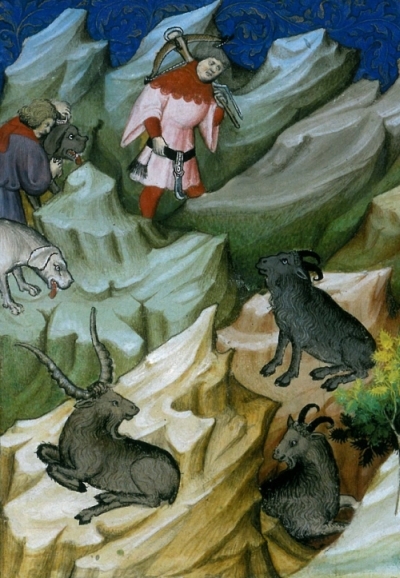 The Livre de chasse is a medieval book on hunting, written between 1387 and 1391 by Gaston III, Count of Foix and dedicated to Philip the Bold, Duke of Burgundy. 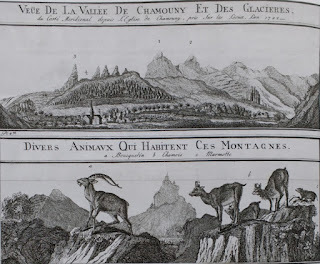 One figure shows an alpine hunt with ibex and chamois hiding between the peaks. Only, as a guide from 1917 describes, fools would venture there. However the Alps since ancient times were a traveled region. Shepherds, merchants, collectors of plants and minerals and hunters populated the valleys, high-altitude pastures and maybe sometimes also climbed a peak. The first person to climb a mountain just "because it´s there" was supposedly Italian poet Francesco Petrarca (1304-1374), as he describes an ascent on Mount Ventoux in France. Italian author Valerius Faventies in 1561 publishes “De montium origine”, wherein he collects all the contemporary theories explaining the formation of mountains. An important role was given to celestial influences. But only later authors like cartographer Sebastian Münster (1489-1552), cartographer Johannes Stumpf (1500-1566), naturalist Konrad Gessner (1516-1565) and especially naturalist Johann Jakob Scheuchzer (1672-1733) describe mountains in great details, including plants, animals and the geology. Fig.2. 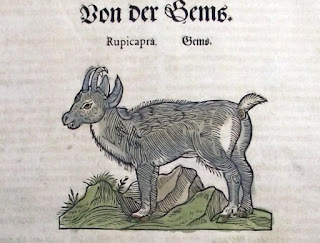 The chamois in Konrad Gessner´s „Allgemeines Thierbuch“ (1565). Scheuchzer used examples of large-scale folds observed in the Swiss Alps as evidence for the veracity of the Biblical account of a flood in remote times. Only a large flood, a deluge, could twist, break and fold the sedimentary rocks. Fig.3. "Views of Chamonix, as seen [during the expedition] in 1742", apart glaciers the drawing shows also typical animals, like the ibex, the chamois and the marmot. Figure from a report to the Royal Society in London by William Windham. 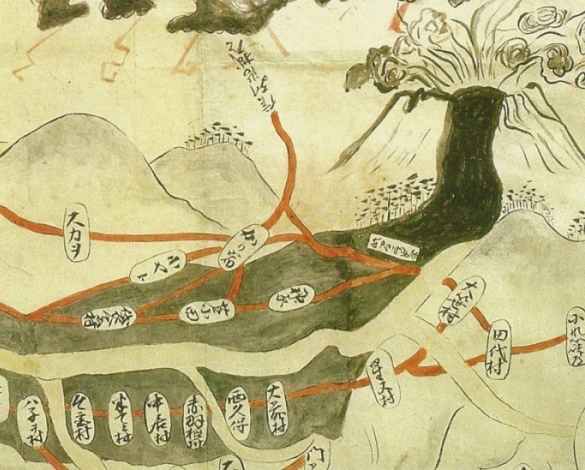 Also English theologian and naturalist Thomas Burnet in his book “The Sacred Theory of the Earth“, published in 1684, tries to explain the mountains and shapes of the continents by the biblical flood. The homogenous primordial crust of earth was shattered, releasing water from the underground. The water covers the entire planet and finally flows back in the fissures, leaving behind fragments of the crust that now forms the modern islands and continents. Mountains, so Burnet, were fragments of the primordial crust of earth stacked atop, ruins of the former perfect paradisic world. Fig.4. The chamois hunter's hunting ground, by Johann Baptist Zwecker (1814–1876). Still for a long time the Alps were seen as haunted, dangerous and most important unholy territory. 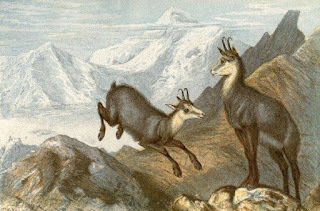 One there was "in company of the devil,..." as Swiss naturalist Horace-Bénédict de Saussure (1740-1799) refers to the chamois when writing about the Alps. 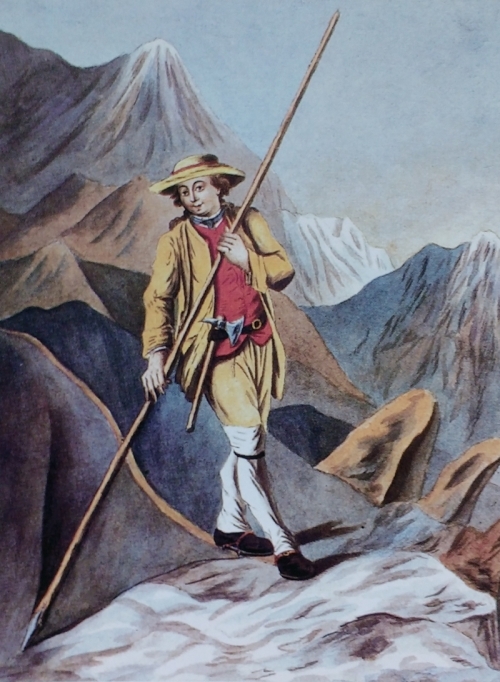 De Saussure was also the first naturalist to describe the geology of one of the highest peaks in the Alps (mostly composed of granite), the 4,808.73m high Mont Blanc, climbed by his expedition in July 1789. Many of the threats encountered on the X-Files are not of this world, but even aliens seem normal when compared to some of our world´s insect species. In the episode "Darkness Falls" (season 1, episode 20) special agents Fox Mulder and Dana Scully are called in to investigate the mysterious disappearance of a team of loggers somewhere in the Cascade Range. Initially suspecting bigfoot (Mulder´s suspect) and eco-terrorists (Scully´s favourite), soon the agents find themselves isolated and trapped by a seemingly ancient menace lurking in the dark of the woods. Filming was done in the Seymour Demonstration Forest, north of Vancouver, a difficult to reach location even for the real film-crew. Soon it is discovered that an unknown species of insects was freed when the loggers illegally cut down old-grown trees. Mulder speculates that the insects, forming a sort of green-glowing swarm in the night, are a mutation caused by radioactive gases released from the underground, but extinct in the wild. 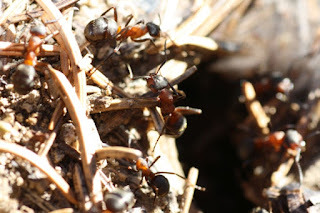 However a swarm of the creatures, in close-up stock-footage of mites was used (mites are not insects, but related to spiders and can´t fly), survived hiding in the pores of a tree-ring, but now the swarm is free, very, very hungry and ready to build a nest. 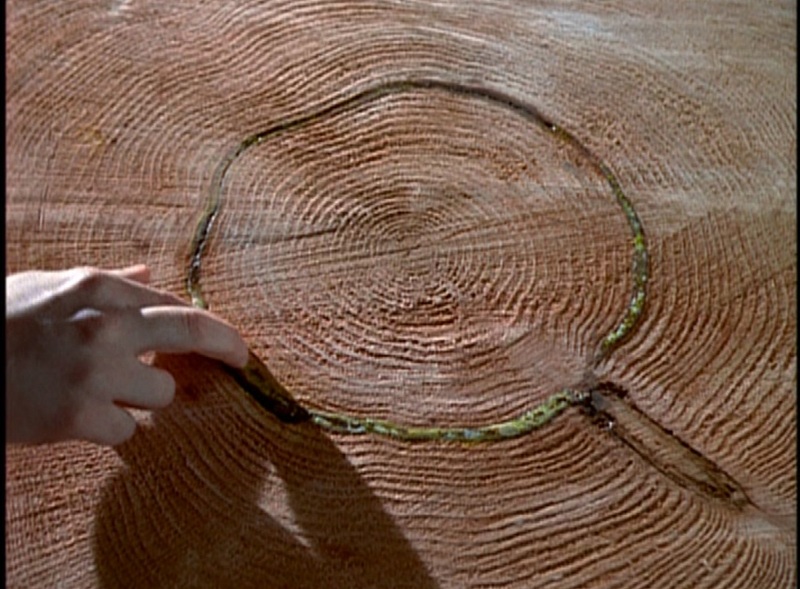 X-Files producer Chris Carter was inspired to write this episode based on his interest in dendrochronology – the study of tree-rings. Fig.1. 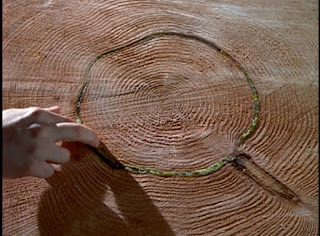 The truth is in the tree-rings of this Douglas-fir - dendrology is used to reconstruct climate change in the past and was used in 1937 by R.H. Finch for the first time to date the activity of the Cinder Cones volcanic field in California. But what about strange behavior of the supposed insects, are there similar real cases to be found? 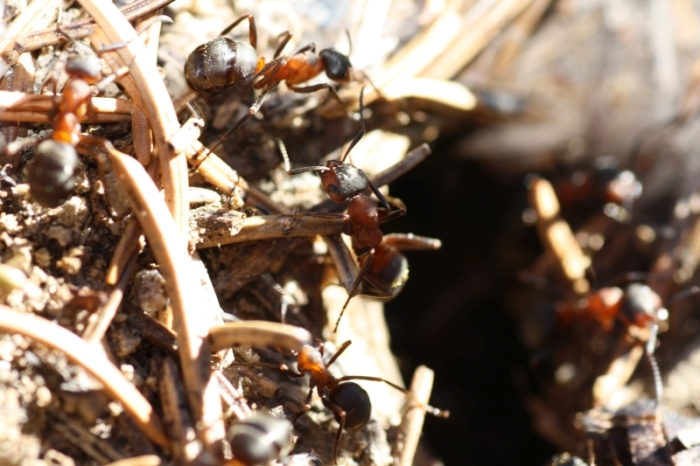 Ants are a common insect group, forming swarms with a complicated social structure and are successfully used as bioindicators - maybe even for gases coming from the underground. Fig.3. 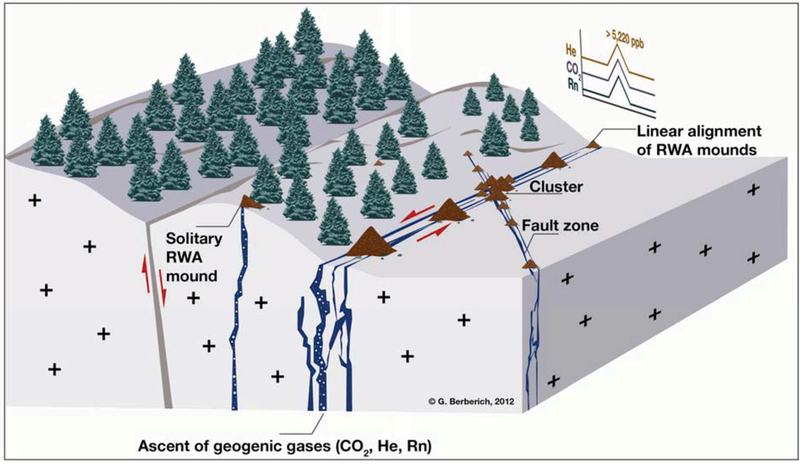 Ant may take some advantages by building their nests on gas-permeable faults, as the warm gases from the underground can act as sort of natural heating, figure from BERBERICH et al. 2013. Mulder: "But, but what if through some fluke of nature, a human was born, who reverted to it's most animal instincts, a kind of carnivorous neanderthal. Wouldn't he occupy a space above us on the food chain?" In the X-Files episode "The Jersey Devil" (season 1, episode 5) special agents Fox Mulder and Dana Scully investigate a supposed serial killer with cannibalistic tendencies hiding in the woods of New Jersey. 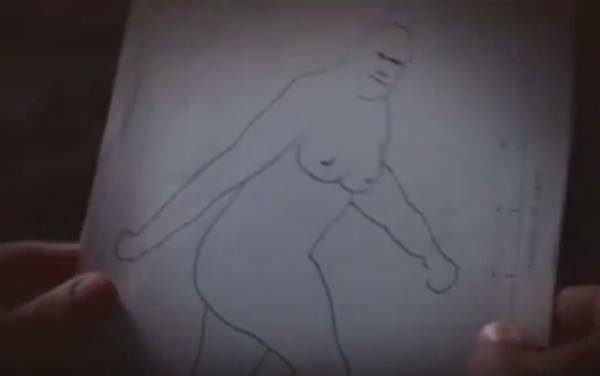 Strange drawings let Mulder speculate about a surviving population of prehistoric man-beasts.. 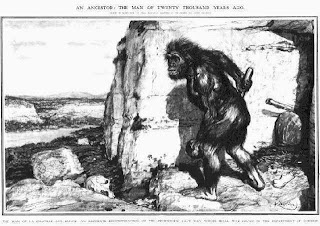 The idea of the missing link, an intermediary creature between apes and man, was introduced by Victorian geologist Charles Lyell in 1837 but still it´s very popular in our imagination. On a cold morning in 1969 local residents of Colville (Washington, U.S.A.) found more than 1.000 tracks of an unknown creature in the snow. Strangely the tracks resembled a gigantic human foot, one track showed even a malformation, caused supposedly by a severe injury. 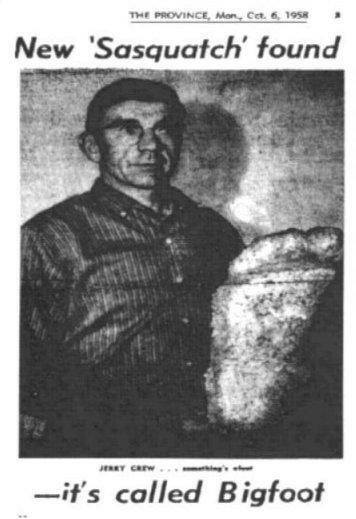 Casts were made of the more unusual tracks and send to anthropologist Grover Sanders Krantz (1931-2002), who soon was convinced that no trickster could fake such tracks – the creature was surely bigfoot, a supposed giant ape living in the forests of North America. Fig.1. Reconstruction of Neanderthal man as ape-man for a newspaper, art by Frantisek Kupka (1909). First tales of strange creatures living in the woods were collected by schoolteacher and amateur mythologist John W. Burns in the 1920s, who however described a myth of a giant race of Indians, not apes. However the modern story of bigfoot started not in America but in Asia. In 1951 with the discovery by Alpinist (with a strange sense of humour) Eric Shipton of large tracks in the Himalayas. Eminent zoologist Wladimir Tschernezky was sure that the tracks were made by a large, bipedal and unknown hominid, maybe a descendent of the extinct gigantic ape Gigantopithecus, living during the Pleistocene in Asia. Journalist John W. Green (1927-2016) published in 1968 “On the Track of Sasquatch”, a book where he, even if not claiming that bigfoot is in fact Gigantopithecus, made the argument that if in the past large apes existed it´s not impossible that such animals still exist. The direct connection between Giganto and anomalous primates was made first by zoologist Bernard Heuvelmans in 1952, based on reconstructions of Gigantophitecus by German palaeontologist Franz Weidenreich (1873-1948) and Ralph Von Koenigswald (1902-1982) as primitive man. 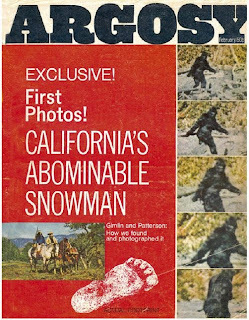 Heuvelman writes “this theory, which is utterly hypothetical, provides the only entirely acceptable explanation of the mystery of the Abominable Snowman.” Krantz after reading Green´s book popularized this idea in TV. Krantz argued that migrating groups of Giganto evolved into local populations of anomalous primates, in Asia into the Yeti and in America into the Bigfoot. In 1955 a certain William Roe claimed to have encountered bigfoot, describing it appropriately now as a “giant ape” (Roe´s story was however never verified) - the idea of humans living hidden in the woods was replaced by apes and suddenly people started to talk about strange encounters with hairy ape-man beasts. 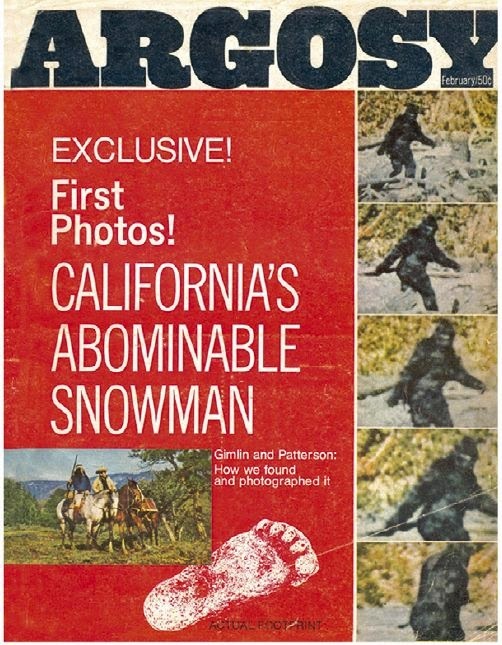 Bigfoot got its name finally in 1958, with an article about alleged bigfoot tracks found at Bluff Creek (California), revealed later to be in fact only fakes. However the entire Gigntopithecus-hypothesis is based on an outdated reconstructions of the species, as is the idea of a linear evolution of humans. Franz Weidenreich reconstructed Gigantopithecus, known only from a fragmentary fossil record, as a sort missing link between apes and man - with the appearance of a hairy ape but bipedal locomotion as humans do. However modern reconstructions see it as related more closely to the orangutan than any other large apes or humans. Bigfoot is however rarely (make it never) described as large orangutan. *As for the tracks of Colville. Amateur bigfoot hunter Renè Dahinden (1930-2001) considered the tracks more than suspicious, as no creature was spotted despite thousands of tracks and the first discovery was made by Ivan Marx, a known hoaxer of bigfoot encounters. Mulder:" ... I found several references to a subterranean organism." Scully: "What are you talking about?" Mulder: "An unknown organism, existing within the volcano. I haven't found anything yet that describes it in specific terms but ..."
Scully: "Mulder, nothing can live in a volcanic interior, not only because of the intense heat but the gases would be toxic to any organism." In the X-Files episode "Firewalker" (season 2, episode 9) special agents Fox Mulder and Dana Scully investigate the death and the disappearance of another member of a team of scientists, busy monitoring Mount Avalon in Oregon, an active volcano ready to erupt. Mount Avalon is a fictional place, supposedly part of the Cascade Range, but in the episode real footage of the eruption of Mount St. Helens (Washington) was used. In the episode the geologists also mention Sherman Crater, found at Mt. Baker. Soon it is discovered that a parasitic lifeform uses humans as a host, nesting into the victim´s lungs. Terrestrial in origin and the result of a parallel evolutionary process, this lifeform bases its metabolism on silicon. As it produces as waste simple silicon-dioxide or sand, the lungs will eventually fill with sand and the host suffocate.The parasite is first discovered when spores are released from rock samples collected by a robot - named "Firewalker" - from inside the crater of Mount Avalon. The idea of Firewalker is based on a real robotic probe, a joint project between NASA and Carnegie Mellon's Field Robotics Center. In 1992 "Dante", as the real eight-legged robot was named, was scheduled to explore an Antarctic volcano. Later the parasite is revealed to be a sort of sponge/mushroom-like organism, growing inside and finally bursting out of its host to release its spores. Fig.1. The full-grown silicon-based organism as seen in the X-Files. In first production sketches the parasite resembled more a worm than a fungus, like previously seen in the episode “Ice” (season 1, episode 8). The writing of the episode is indeed very similar to this episode, as an isolated team of scientists is threatened by an unseen killer, paranoia spreads fast (anyway both episodes are very similar to the “The Thing” from 1982 and “Alien” from 1979). In the final version the fungus appear to be inspired by specimens of Cordyceps, a genus of endoparasitic fungi of small animals. In life as we know it only ten elements play a mayor role: carbon, oxygen, nitrogen, hydrogen, potassium, calcium, magnesium, iron, phosphorus and sulphur. Strangely carbon is among the rarest elements on earth, so why is it so important in the biosphere? Carbon can form stable and complex macromolecules within the temperature range found on earth. Atomic bounds between the carbon-carbon, carbon-oxygen and carbon-hydrogen atoms are very stable and the formed molecules are soluble and stable in water, important property for terrestrial biochemistry. Silicon is very common in earth´s rocks but rarely used by earth´s life, even if it´s popular in aliens (according to science-fiction tropes). Microorganisms like radiolarians and diatoms use silaffins, a unique type of peptides, and silica-hydrogels Under higher organisms only siliceous sponges are known to use silicon. However all those organisms use silicon only to build their shells or skeletal structures, not directly in their metabolism. Fig.2. 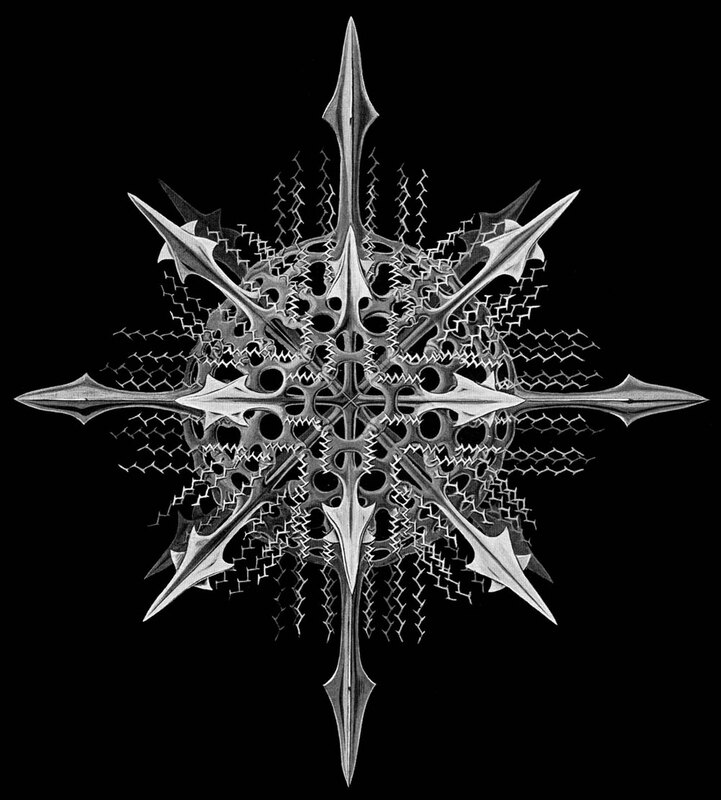 Drawing by biologist Ernst Haeckel of the silicon-skeleton as seen in the group radiolaria. Charles Darwin even remarks in "Origin of Species (1866) that "Few objects are more beautiful than the minute siliceous cases of the diatomaceæ: were these created that they might be examined and admired under the higher powers of the microscope?" Under terrestrial environmental conditions silicon-based life is highly improbable and anyway not competitive with carbon-based life. However as silicon is found in the periodic table near carbon it displays some similar properties, suitable for life in general. Silicon forms stable (however not as stable as carbon) bounds with itself and other elements like carbon, germanium, nitrogen, phosphorus, oxygen, sulphur and many metals. Those silanes can form complex and flexible macromolecules, forming sheets, chains and tubes needed to form parts of a living cell. However silicon shows a very strong affinity to oxygen, as shown by the very common minerals-group of the silicates, composed mostly of silicon and oxygen. Earth´s atmosphere is composed of 21 percent of oxygen and silicon lifeforms would probably have troubles as the oxygen would slowly corrode their bodies. Also water would do more harm than good to the relatively delicate silicate molecules. 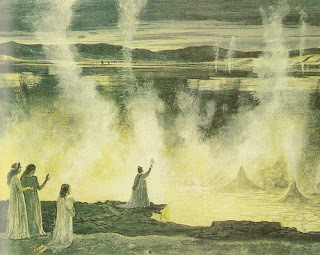 A silicon-lifeform would need therefore a reducing atmosphere, scarcity of water, low temperatures to stabilize the silicon-silicon bounds and an alternative solvent for the silicon-molecules, like liquid methane (highly unlikely idea but not outside the realm of extreme possibilities, as lakes of methane are found on the moon Titan). In “Firewalker” the science is in part plausible. The silicon lifeform is found in (presumably) anoxic conditions and it is stated in the episode that oxygen will kill the organism by destroying its molecules. However temperatures are very high inside an active volcano (strangely also in one scene they try to kill the parasite with fire... it survives a volcano but can´t stand a fire?! :/), so that may be implausible for a silicon-based organism. To be fair geneticist J. B. S. Haldane (1892-1964) proposed that silicon-lifeforms could survive inside a planet feeding on partially molten rocks. Another contradiction seems to be the parasitic nature of this hypothetical organism. It´s not clear from the episode if the organism is an obligatory parasite or the spores simply and by accident grow inside the infected researchers. Scully discovers that the spores don´t react with any carbon-based tissue and have no preferred range of temperatures for growth. However, as Scully speculates, the spores die so quickly in the superficial environment that maybe she wasn't able to collect some living specimens. The interior of a carbon-based organism, also mostly composed of water (on average, the body of an adult human being contains 60% water), would probably be anyway hostile to a silicon-based parasite. Mulder: "...The data it collected from the earth's interior will never be known. And of the events that occurred at Mount Avalon between the 11th and 13th of November, 1994, mine stands as the only record." 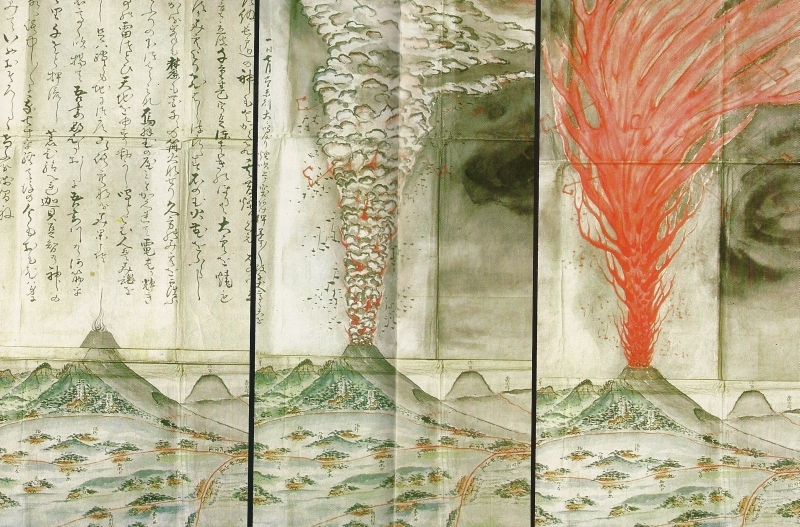 The eruption of Mount Asama in Japan in the year 1783 was among the strongest in recent history. It is rarely mentioned, however there survives plenty of contemporary documentation, most hosted nowadays in the collection of the Asama Volcanological Observatory and Mount Asama is also one of the best monitored volcanoes since 1934. 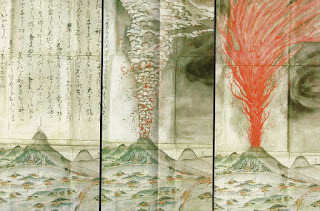 Already after May 9, 1783 some smaller explosions announced the awakening of the volcano. July 26, a large eruption column above the summit crater marks the beginning of the main eruption phase, lasting until August. August 4, a pyroclastic flow destroys 18 square kilometer of forest. August 5, another pyroclastic flows destroys four villages, killing thousands. The very same day the eruption starts to lose power. The various eruption phases of Asama, from from the collection of historian Kenichi Maruyama (photo by volcanologist Maurice Krafft). Another drawing shows the eruption column, lapilli-ash-fall and volcanic lightning, from the collection of the Asama Volcanological Observatory (photo by Maurice Krafft). "We can affirm as for sure, that it [the crystal] can be found in rocks of the Alps, often on so inaccessible sites, that only by climbing [on a rope] one can recover it." Fig.1. Painting by Henry Lévèque with the title “Crystal searcher Jacques Balmat” (first to ascend Mont Blanc in 1786). Does praying help prevent natural disasters? Saint Januarius is the patron of Naples and annually a flask of his (supposedly) blood is presented during a public procession in the city. If, so the legend goes, the dry blood becomes liquid again the city will be spared of any disaster and misfortune. It must be said that the supposed premonitory miracle and its interpretation is very complicated. Factors like timing, how much and how the blood liquefies, color and density of the resulting liquid play a role. Fig.1. The eruption of Vesuvius in 1631, Saint Januarius is shown above the vulcano. He's a silent guardian, a watchful protector.... most of the times. 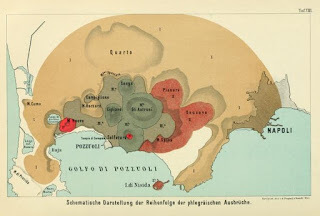 The first supposed miracle happened in 1389 and in 1924 geologists Giovanni Battista Alfano (1878-1955) and Antonio Amitrano compiled a list, looking on how well the premonitory signs correlates with disasters or the lack of such. 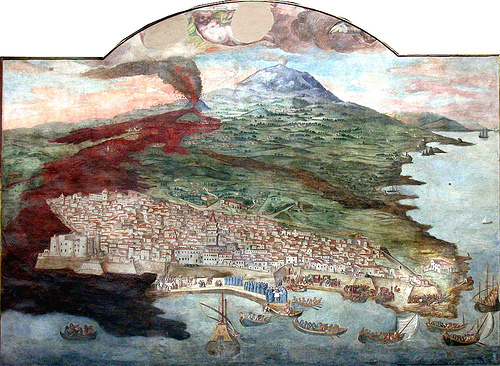 In years where the miracle failed to happen Mount Vesuvius erupted eleven times and nineteen earthquakes hit the city. 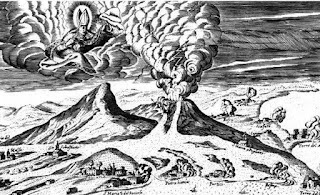 In years when the miracle happened Vesuvius erupted just five times. So it seems that divine protection works half the times. 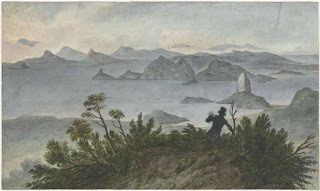 Also whenever Vesuvius seems to become active a procession with the relics of the saint is organized to implore divine protection.These processions helped diplomat and amateur vulcanologist Sir William Douglas Hamilton (1730-1803) to reconstruct the activity of Vesuvius in recent history. Fig.2. "The recent eruption of Vesuvius: scenes of terror and piety in the face of the eruption", by Achille Beltrame (1871-1956), cover of the newspaper "La Domenica del Corriere" April 1906. Naples is not the only city with a holy protector. In Catania it´s Saint Agata. 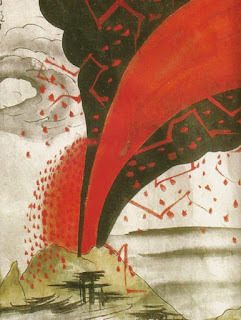 According to local folklore a veil of the saint has the power to stop a lava flow. 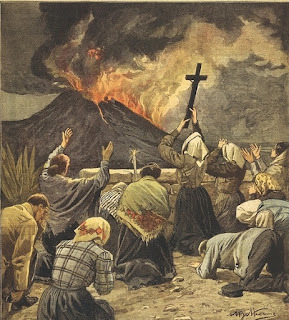 During the disastrous eruption of Mount Etna in 1669 Saint Agata was invoked. For a time the lava flows could be diverted by a group of brave men, building dams of lava rocks in front of the advancing flow and digging alternative paths, also the walls of the city of Catania resisted. But finally the lava entered in a breach of the walls, claiming 15.000 victims. Fig.3. Fresco by painter Giacinto Platania (1612-1691) of the eruption of Mount Etna in 1669, Platania witnessed the eruption himself and the painting is quite realistic, showing the lava flows stopped by the city walls. Still in 1971 divine protection was claimed for the city of Sant'Alfio, near Catania, and it apparently worked this time. As why those inconsistent results over time - as they say the lord works in mysterious ways. The Sugarloaf Mountain (aka: Pão de Açúcar) rising almost 400m above Rio de Janeiro is composed of granitoid rock – a plutonic rock formed by the slow cooling from magma and composed mostly of the minerals quartz, feldspar and mica. Fig.1. 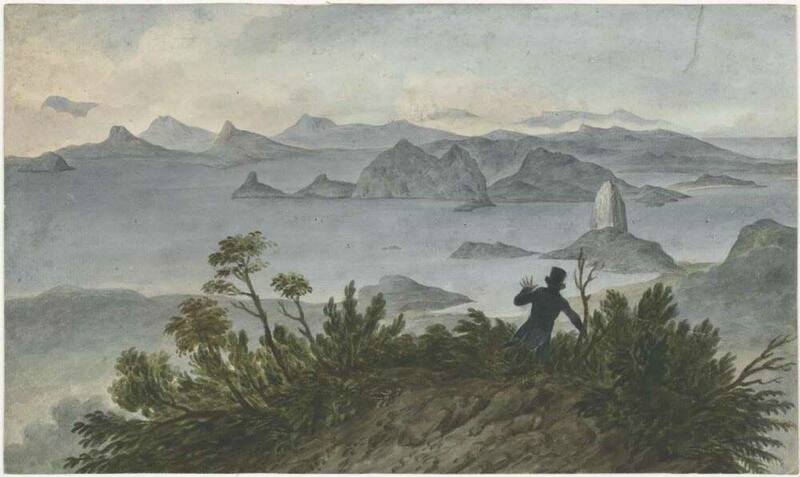 View of Rio de Janeiro with Sugarloaf Mountain as seen from the Corcovado by HMS Beagle artist Augustus Earle. 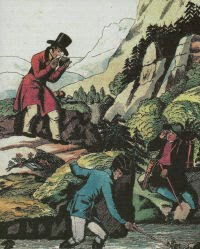 Indeed the Sugarloaf is, as correctly described by Darwin, composed mostly of augen-gneiss, a metamorphic rock with single large, often elongated, crystals, resembling eyes in a finer matrix of smaller crystals, therefore the name as auge means eye in German. Fig.2. 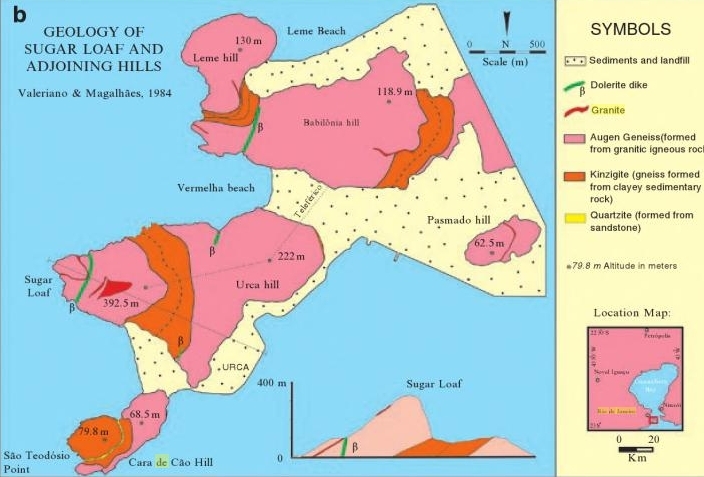 Simplified geological map of the Sugarloaf and surrounding bornhardts, from MIGON 2010. The Sugorloaf is also evidence for plate tectonics. 560 million years ago, when the ancient supercontinent of Gondwana started slowly to break apart, large magmatic bodies intruded into the weakened crust, feed from below by the Tristan da Cunha hotspot. Fig.3. 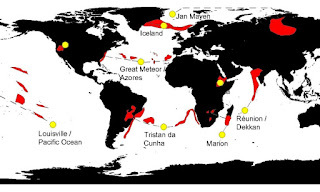 Large Igneous Provinces (LIP) and correlated hotspots. Magmatic rocks of the same type can be found on both sides of the Atlantic Ocean, showing that South America and Africa once were one single continent. Slowly cooling in the upper crust these magmatic bodies formed a large granitic pluton. During the movement of the continents parts of the pluton broke apart, as we find the same type of rock along the coasts of South-America and of Africa, also some metamorphism and deformation of the rocks occurred and the cleavage of the gneiss formed. Later finally the metamorphic pluton was pushed upwards and erosion started to form the modern landscape of Rio with the hard augen-gneiss towering above weaker and more erodible rocks. The Grotta del Cane (the Dog´s Cave) is a short, 9m deep, artificial gallery located on the rim or the basin of Agnano near Naples. The basin is in reality the remains of an 8.000-4.000 year old collapsed volcano, just one smaller caldera of the Phlegraean Fields. Fig.1. 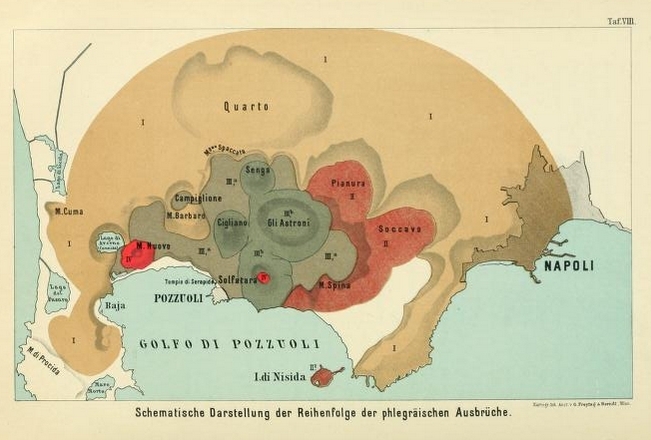 The Phlegraean Fields with the caldera of Agnano located almost at the center, from SUESS, E. "Das Antlitz der Erde" (1892). Since antiquity the area is known for it´s volcanic activity, like hot springs and fumaroles, called mofettes. 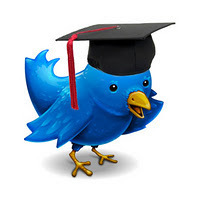 called it by the name Aornos, that is Avernus, or the Bird-less." Naturalists from Antiquity until the Renaissance know of the strange phenomenon and speculated about toxic vapors coming from the underground, killing smaller animals. German polymath Athanasius Kircher (1602-1680) suggested that “Ochre, Sandrak*, Orpiment and Arsenic” compounds, known at the time to be toxic (and very popular as pigments to paint), were to blame. 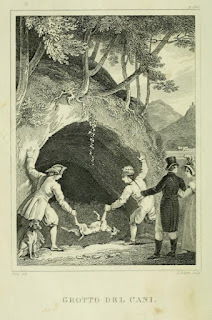 In the early 19th century naturalists in self-experiments determined that below a certain level in the cave they experienced a strange dizziness and started to lose feelings in their legs. Those were recognized as symptoms of a carbon-dioxide intoxication. 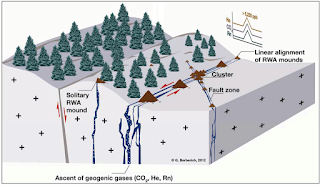 The invisible and odorless carbon-dioxide is heavier than normal air and tends to flow to the bottom of wells and caves. The gas emanates from the volcanic underground and accumulates in the dog´s cave. At the entrance the layer of carbon-dioxide is just sufficiently thick to suffocate smaller animals, deeper in the cave it can become dangerous also for humans. Fig.2. Demonstrating the deadly effects of the dog´s cave, from “The book of curiosities: containing ten thousand wonders and curiosities of nature and art” (1822).